The article was also published in News Archive at ZETEO Shopping Village. At the time of writing (4. Nov 2005) the link http://www.zeteo.com/avia-mini/News97.html was not active . Among the many letters we have had from our readers following publication of Avia Mini I and II have been a number requesting one-make histories of various toy and model aircraft ranges. A name that cropped up repeatedly was that of Siku, so with the aid of Jonathan Morley of Sieper Werke GmbH, to whom we express our grateful thanks, here is a brief history of Siku aircraft. Richard Sieper launched his new company in Germany into the raging inflation of 1921, building a foundry in Lüdenscheid. First production was of aluminium cutlery, but once a toolmaker's workshop was added, the company was able to make many other products, tobacco tins, tin matchboxes, ashtrays and so on. By 1933 production had expanded into badges and belt buckles, a patent for an alloy buckle being a key factor. Alloy uniform buttons with an oxidised finish led to experimental production in plastics. Thereafter, injection moulded products such as badges, plaques and figurines formed the basis of future production. During the Second World War, in 1943 a second factory was opened 100km distant, in Hilchebach, where buttons were made in the post-war period, but new specialist plastic products including bathroom furniture are made there. At the Lüdenscheid plant, plastic combs and advertising items were made, leading to the Sieper Kunstoff (plastic) name, shortened in 1950 to Siku, which was registered as the new trade name. The same year toy production began, with farm animals and a toy aquarium, followed by a wide range of cheap toys and gift ware. This in turn developed into a toy car range, which by 1958 became the main product of the company, with over 100 plastic vehicles and 400 accessories. In 1963 the model car range switched from plastic to diecast zinc alloy and developed into the range which still exists today. In 1984 Siku took over Wiking's 1:87 plastic range, so they are also the inheritors of the old Wiking aircraft tradition. 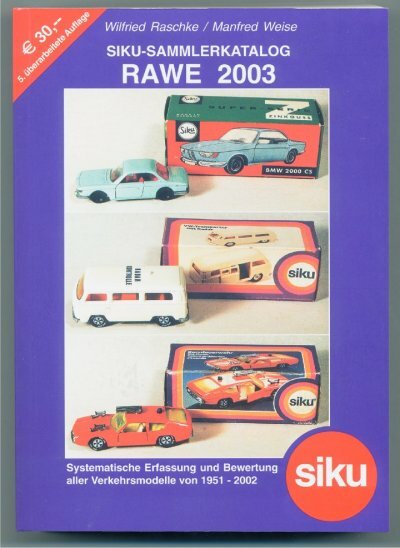 Today Siku is a market leader around the world for diecast model vehicles, with three factories in Germany and one in Poland. There are 820 employees and with 75 years in business behind them, Siku have lots of plans for the future. These plans however, do not include resurrecting the Siku plastic aircraft, unfortunately. In the references listet below you can find some more information about the history of the Siku company and some general comments on the aircraft product range. PAK-20 Burns (2003) , though with no reference to Siku origin. The only reference I have are from a letter to the editor in Avia Mini IV, which is quoted here . At least from my own comparison they must have been produced from the moulds of Siku aircraft. I found this article also as http://www.herpa.de/magazine/pdf/ww598/24-27.pdfon HERPA Homepage . This link is no longer active. [L1] Siku / About Siku General History of Siku company since its foudation in 1921 . Just one sentence on Siku aircraft.